BlogHome » Do you recognise this location on our shop front window? Welcome to our new business located in Hamilton South. As a local family, we are passionate about the lifestyle and opportunities Newcastle provides. As an avid photographer, I wanted to somehow combine this with my career as a health professional. What better way than to show off our iconic Merewether ocean baths on our health center’s front window. Be sure to check out the image next time your drive past, we are located at 59A Stewart Avenue, Hamilton South. 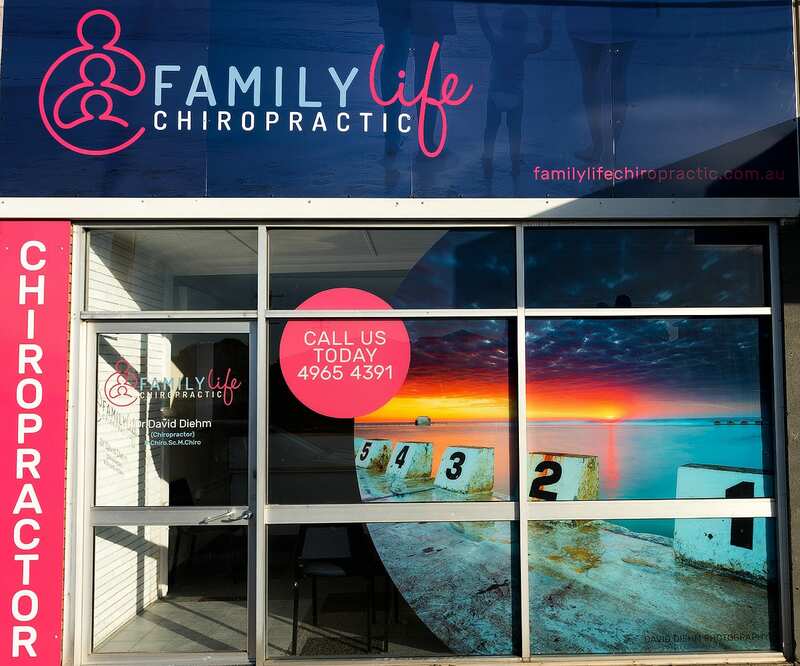 Family Life’s founder and principle Chiropractor, Dr David Diehm has been serving the Newcastle, Lake Macquarie and Hunter communities for over 11 years. David has a passion for listening to and helping people. When this is combined with his experience and knowledge of the spine and nervous system you can be confident both yourself and your family are in great hands. After Graduating from Macquarie University, with a Bachelor of Chiropractic Science and a Masters of Chiropractic, David found his way to Newcastle with his wife Kathryn. A country boy at heart, the area had instant appeal! “As we welcome our second child into the world, we have both reflected on our journey into parenthood and feel we owe a deep sense of gratitude to what chiropractic has been able to offer to the health of our own family. With this realisation and our mutual passion for healthy lifestyle choices, Family Life Chiropractic was born. Our center is driven by our desire to share our passion for chiropractic, a healthy spine and nervous system, so other families can benefit in the way we have. We believe healthy families can create a healthy community”. We understand a health concern can be a stressful event, particularly in a busy family environment. There is often confusion, uncertainty and sometimes, the feeling no one is listening. We pride ourselves on an approach that takes the time to understand your concerns, we are comprehensive in our examination and welcome a dialogue that allows you to understand very clearly what we are finding. Support and empowerment are two vital elements you and your family will receive from us. Health is a journey and we wish to provide an environment that is friendly and professional while you experience and enjoy the benefits of Chiropractic care. Thanks for taking the time to read our story and journey thus far. I hope our regular blog posts here may provide some value or help you in your journey.